Since 2014/2015, students have an opportunity to become more engaged in the life of the faculty – by becoming volunteers. The project of FA volunteers started as an initiative of the students themselves – some of them went to spend a term at universities abroad, experienced the local volunteering culture and wanted to introduce something similar at their home faculty. In the past year, more than seventy volunteers took part in about thirty events and their contribution was really appreciated. At the moment, the volunteers are planning how to make the September enrolment of new students more welcoming and efficient. How are the volunteers rewarded? If they work for 40 and more hours in one academic year, the volunteers are rewarded by t-shirts, books and a bilingual certificate signed by the dean. Such a certificate can be very useful in job interviews or as a supplement to various applications. 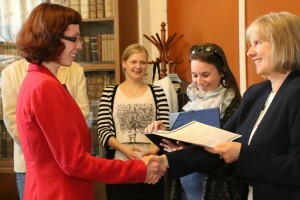 In May 2015, the certificate was awarded to five volunteers. How does volunteering at FA work? Students sign up with the faculty coordinator who then approaches them with offers to participate in various events (the annual FA Doors Open Day, conferences, guest lectures, entrance exams). For more information or to sign up as a volunteer, kindly contact Sára Vidímová (sara.vidimova@ff.cuni.cz). Which events have you taken part in so far? 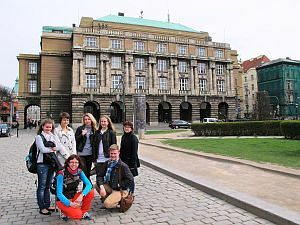 As a volunteer, I took part in the guest lecture by the Russian historian, Professor Andrej Zubov, in the symposium “100 Years of Slovenian Studies at Charles University,” the FA Doors Open Day and the FA Research Fair. What do you enjoy about being a volunteer? I am glad that I have the chance to get to know the different parts of the faculty, to become more engaged in the events, to meet new people and gain new experience. Is there anything you would recommend to students who hesitate about becoming volunteers? If you enjoy getting to know new interesting things and people, don’t hesitate and try it!